One of These Days is a great short story by Gabriel Garcia Marquez. Unfortunately, the story was first published in 1962 and is not currently in the public domain and cannot be displayed. A humble dentist, Aurelio Escovar, lives in a town where with a very corrupt, even murderous mayor. 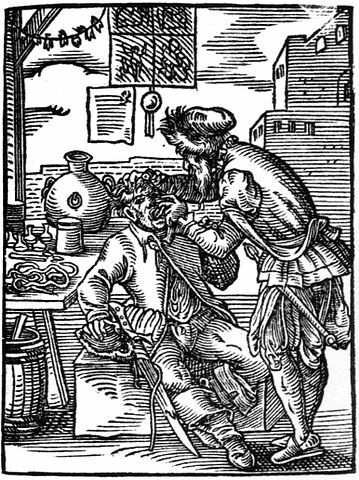 When the mayor arrives in his office the dentist refuses to treat him; preferring to continue to polish a set of false teeth rather than relieve the suffering of the corrupt mayor that he despises. The mayor pulls a gun on the dentist and demands treatment. We learn that the mayor has been suffering from the severe toothache for five days. The dentist admits the mayor and treats him, removing the infected wisdom tooth. He does so without the aid of anesthesia saying, "Now you'll pay for twenty dead men" as he begins to pull the tooth. As the mayor is leaving the dentist asks where he shall send the bill "To you or the town?," the mayor replies, "It’s the same damn thing." Add One of These Days to your own personal library.